By now, it’s clear that Guardians of the Galaxy Vol. 2 is another critical and commercial success for Marvel Studios. Fiefo covered a lot of the film’s strengths in his non-spoiler review and I agree with his assessments. But this movie offers so much that can’t be talked about without going into spoiler territory – despite being the 15th film in the Marvel Cinematic Universe and a sequel to Guardians of the Galaxy, Volume 2 is still very different and quite fresh and I’d like to highlight all these aspects today. AGAIN – I will be talking about SPOILERS so if you haven’t seen Guardians of the Galaxy Vol. 2, you may not want to read further. In a similar fashion to how Winter Soldier was a movie filled with political intrigue, how Ant-Man was a heist film, and how the first Guardians of the Galaxy was a space opera, GotG Vol. 2 is Marvel’s first movie about family. Each of the main characters’ arcs has something to do with family: Batista and Mantis lost theirs, Gamora and Nebula deal with sibling rivalry, Rocket had none and is struggling with being in one, Star-Lord has his father-in-law stuff with Ego and Yondu, and they all sort of act as Geo’s parents. I’m impressed at how each MCU film still manages to be different this many titles in. Speaking of being different, one of the common complaints that I’ve seen about Volume 2 has something to do about it’s plot and I think it’s because this movie doesn’t explicitly follow the usual three act storytelling approach. I have to be honest – I did find myself asking where the plot was heading towards more than halfway through the film! That doesn’t necessarily mean that I didn’t like the movie because I loved it, but clearly it turned some people off. And I’m mentioning this because there are people who say that Marvel movies have become stale or predictable due to them following that three act approach – when you stay away from that, it becomes less palatable for some people. As a Marvel fan, I’m glad to see that Volume 2 still worked for the majority despite this. The Sovereign were meant to annoy and distract from the real threat. 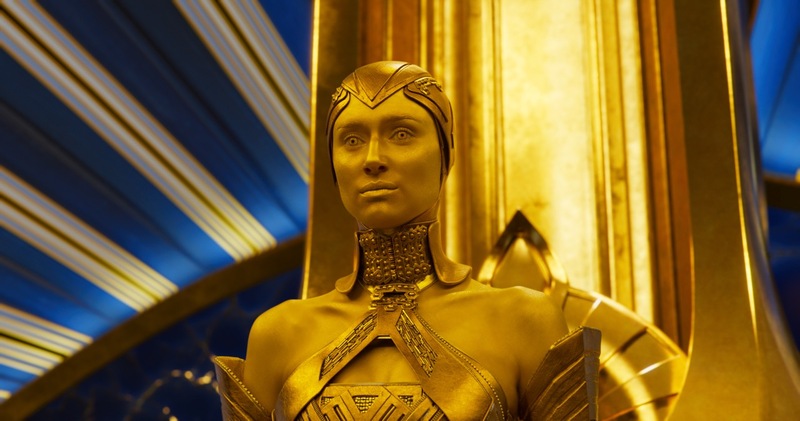 Another common complaint that I’ve seen about Guardians of the Galaxy Volume 2 is about the Sovereign. A lot have said that they’re unnecessary, that they were never really positioned as a threat to our heroes. But I think that’s the point – they’re joke antagonists that merely serve as an annoyance. If you found sequences with the Sovereign to be annoying, then they fulfilled their purpose well. If James Gunn is going to follow through on his Sovereign post-credits scene and introduce Adam Warlock to the MCU, how is it going to play out? Adam Warlock played a major role in the Infinity Gauntlet comic book storyline, leading Earth’s heroes against Thanos. If Adam Warlock is going to be a significant part of the upcoming Infinity War, would a post-credits teaser be enough of an introduction? The third Guardians of the Galaxy movie won’t happen until after the sequel to Infinity War, so Adam Warlock may end up not being used in the MCU’s climax after all. 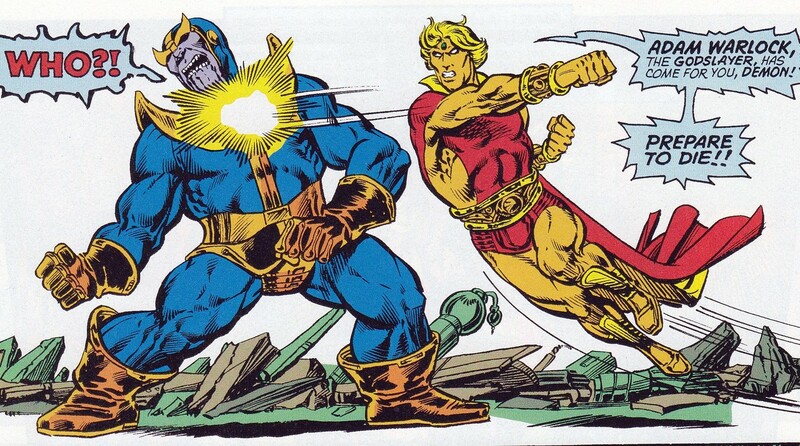 Gold-skinned Adam Warlock was critical in Thanos’ defeat at the end of the Infinity Gauntlet storyline. Is Ego enough to stop people from saying that MCU films don’t have interesting villains? 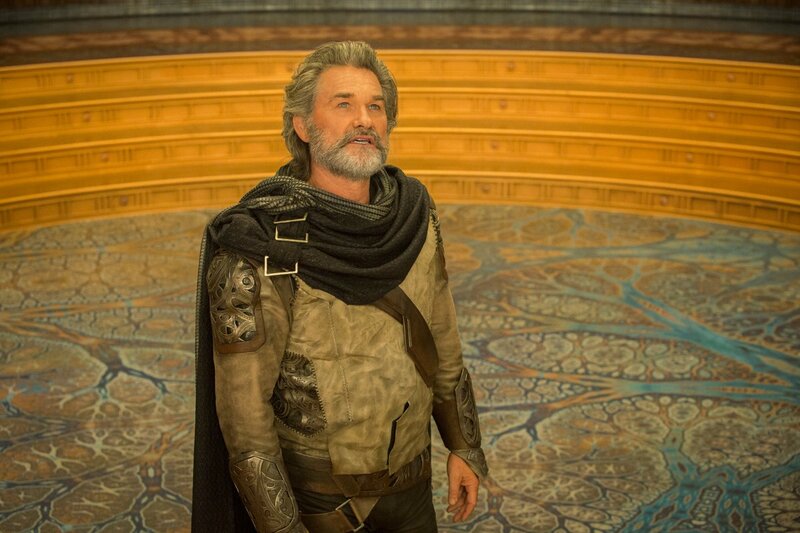 I mean, Ego is awesome – portrayed by Kurt Russell, Ego’s motivations for doing what he’s doing is clear and understandable. I mean, if you’ve spent eons of your existence being alone, wouldn’t you want other living planets for company? And if you think Ego is “evil” for not caring about the billions and trillions of lives that he’ll end in the process, don’t forget that we’re talking about an immortal here. He cares as much for us as we do for that last bunch of ants that we wiped off our kitchen counter. We’re mortal; our lifespans to Ego last for mere moments, so its understandable how little it is that he values us. Ego is definitely one captivating MCU villain. I love how each of the Guardians characters shows growth as the film progresses; all except Drax, who seems to have experienced his character growth offscreen, in between the two Guardians movies. He is the only one without an arc and his role in the film is to provide the laughs and to play off of Mantis. I understand why; there’s no more room for Drax-specific subplots in this already crowded film. I’m hoping to see more for Drax in the next installment. 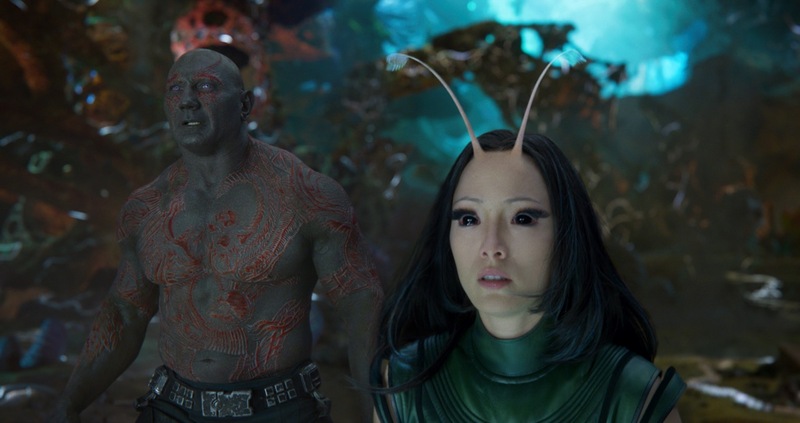 Drax and Mantis play really well off of each other. Can’t wait to see where their relationship goes in the next film. I was afraid that the producers would overuse the Baby Groot character, and I’m glad to say that they didn’t. Also – it’s rare for filmmakers to keep repeating a joke or gag as many times as Gunn did with the “find Yondu’s fin” Baby Groot moment. Normally, after the third repeat it’d already be tiresome (it was) but Gunn somehow managed to make it funnier by pushing way past the third time and having Baby Groot bring in even more absurd items. Also: Teen Groot! Awesome idea! This flips the script around Star-Lord, who used to be the annoying one in the Star-Lord/Yondu dynamic. The themes that Guardians of the Galaxy Vol. 2 deals with here are surprisingly emotionally deep. Gamora and Nebula only had a few scenes to their own that allowed them to progress their sibling rivalry arc but by the end of it, you get a good understanding of why Nebula acts that way toward her sister. And the foster daddy/biological father arc of Star-Lord, Yondu, and Ego… where do I even start? Anyone with daddy issues will get that emotional gutpunch once everything comes to a head. Yondu stole this whole film. Great job, Michael Rooker! 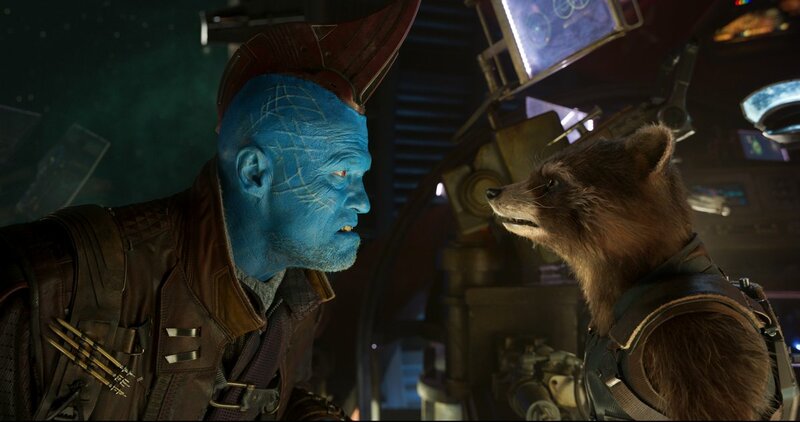 Speaking of Yondu… Michael Rooker! Loved him in James Gunn’s Slither, loved his portrayal of Merle in Walking Dead, and I’m very happy to see him get such a big role in a major film. This story takes the character to many different places; rejected by his Ravager peers and overthrown by his Ravager subordinates, then accepted into the Guardians only to die saving his “foster son”. We finally see the reason why he hung onto Peter and never gave him back to his father and when we do, his stock jumps dramatically in our eyes. Awesome. And there you have it, some thoughts and talking points not covered in Fiefo’s non-spoiler review for obvious reasons. This is how a sequel should be done – it furthers the growth of its characters, tests their relationships, and expands on their motivations. If you haven’t seen it yet (how in the world did you get to the end of this article??? ), you should see it as soon as you can. Have you seen Guardians of the Galaxy Vol. 2? What did you think about it? Drop us a line or two below and share your thoughts!